EXCESSIVE use of 3D technology at home can result in eyestrain and headaches, particularly when one is predisposed to such conditions. It can trigger problems in eye alignment, focusing and coordination, and sufferers may need to see an optometrist to get glasses or vision therapy. Stereovision from current 3D technology renders only an approximation of the real 3D view that human eyes can see. It “tricks” the eyes by making them view two slightly different projections and causes an unnatural disruption to how the eyes would normally align to maintain focus. Nearly 15 per cent of people, including adults and children, have poor eye alignment. This figure does not include only people with crossed eyes and lazy eyes, but also those with focusing issues and intermittent eye alignment problems. Some electronic manufacturers have issued health warnings that viewing 3D TV may cause motion sickness, perceptual after-effects, disorientation, eyestrain and decreased postural stability. 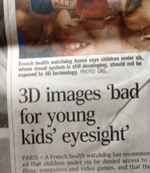 Those who encounter problems have been advised to stop watching 3D immediately and consult an eye specialist. Users of 3D technology should take frequent breaks and avoid watching 3D TV/movies if their eyes feel tired, dry or experience other symptoms, and not resume for at least 30 minutes after the symptoms subside. After watching 3D shows, users should take care to avoid falls, especially if they feel dizzy. They should also get their eyes checked regularly by an optometrist.